SSR LLC – Axiall – Something Else Up Its Sleeve? Option 1 would be a huge tactical error in our opinion and would suggest that Axiall is not listening to its shareholders and at the same time is a poor student of very recent history. Our conversations with many investors suggest that all favor a deal with Westlake, or someone else, and a strong leaning towards voting for Westlake’s slate of board members in the coming shareholder meeting. Those shareholders who did not vote in favor of Trian’s plan for DuPont in May of last year saw an immediate 8% decline in the stock and a subsequent 35% decline in the stock as the company continued to disappoint on earnings. This resulted in the board finally making the decision to remove the CEO, something Trian was not looking for – the company just wanted a board seat. It is unlikely that shareholders of Axiall will follow the same path that shareholders of DuPont did last May given that clear lesson. There is no debate around whether the PVC/chlor-alkali markets need consolidation and a Westlake/Axiall combination is strategically optimal. Option 2 – There is someone else. This would be the only face saving move for Axiall in our view and it would need to be a good offer – either in cash, or in stock from someone who can pull out as much synergy as Westlake. The only companies who could pull out the synergies to the maximum would be existing PVC players and we do not think that either Oxy or Mexichem would be interested and both ShinEtsu and Formosa are busy investing in ethylene already. Ineos is the only logical consolidator in our view – this would have to be all cash. The second group are those with too much ethylene in the US – Lyondell, Shell, Williams (and possibly Ineos again). 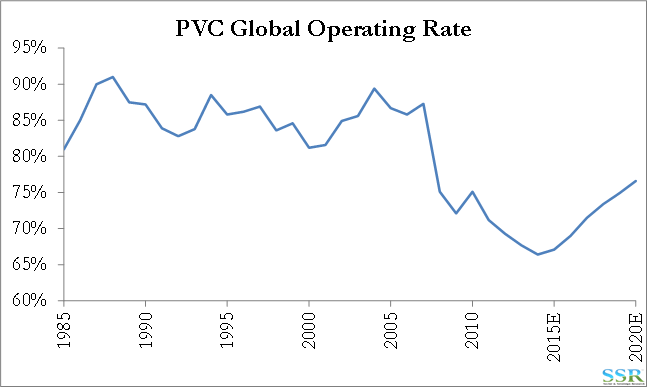 With the exception of Ineos we do not see any of these companies interested in jumping into PVC. The third group are non US players wanting a US foothold. Lotte already has this with the ethylene venture (regardless of the eventual partner); Indorama has a toe hold through the PTA/polyester chain; Reliance and any number of possible Chinese companies (given the move that Chem China just made) are most likely to take a look. We think that the Axiall team and its advisors must know that playing this out through the proxy process is a long odds and potentially embarrassing path to take – consequently we believe that there is a deal in the wings and if it does not come off soon, the company will engage with Westlake. Regardless, we would own the stock even with the increase today – we believe in higher synergies than are implied in the revised offer though much of the upside is likely gone with this offer.